Well enough about us, let's get down to business, the real reason you came to this post: to find out what giveaways are going on in the outdoor blog-o-realm. With everything that's been going on, I haven't been able to keep up with everything like I normally do, but there are a couple that Robin found for me and of course the monthly giveaways that are still happening. Remember if you have a giveaway going on feel free to drop us a line at appalachiaandbeyond (at) gmail (dot) com if you'd like us to mention it in our weekly round up. First up is Sylvan Sport Go. The folks at Sylvan Sport (remember the big Hunt giveaway they had early for a Sport Go and huge prize pack?) well they're at it again, this time it's not as complicated as finding where they hid a Sylvan Sport Go and actually travel to find it. No, this time it's a simple giveaway once they reach 3000 likes on their Facebook page. What's up for grabs? It's a Yakima BowDown . So what are you waiting for, head over to Sylvan Sport Go's Facebook page and click that "Like" button. They have over 2700 fans right now so it's not much longer until they reach the 3000 mark. The next highlighted giveaway is simple. 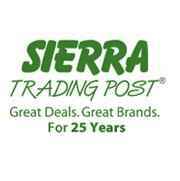 Sierra Trading Post as you may or may not know is currently celebrating their 25th anniversary. As part of that celebration, they've been giving stuff away like crazy from their Facebook page. Gift cards galore, and everyday a new prize pack. For the gift cards, they have a quiz you can take and are automatically entered to win 1 of 25 $25 gift cards. For the daily giveaways, just enter through the link on their daily giveaway wall post. Today is a camping package valued at $1000. Of course to enter, you will need to allow the wildfire app on Facebook. Those are the big, new giveaways that Robin found for you today, but there is a ginormous giveaway event that is coming up in the very near future. 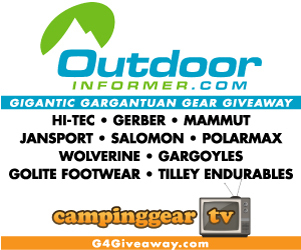 The folks at Outdoor Informer and Camping Gear TV have teamed up to bring us a big giveaway opportunity in the next month. It's the Gigantic Gargantuan Gear Giveaway (G4) that will run through the month of August. Up for grabs, over $7,500 of outdoor gear. There will be 15 winners in this giveaway, each will receive a prize pack at an estimated value of over $500. Josh, Ben, and Jason somehow managed to get over 30 outdoor companies pony up some great gear for this giveaway. Remember, this giveaway starts on August 1 and you can enter once per day. Check out OutdoorInformer.com and CampingGearTV.com for more details and updates. So that's all the new and big stuff, let recap some others that have been going on this month. Of course OutdoorInformer.com still has it's monthly giveaway - an ENO Prize Pack complete with ENO Double Nest Hammock , and other items that go along with the hammock, you have until July 31st to enter for this awesome package. PAHikes.com have the pocket chainsaw the are giving away this month. 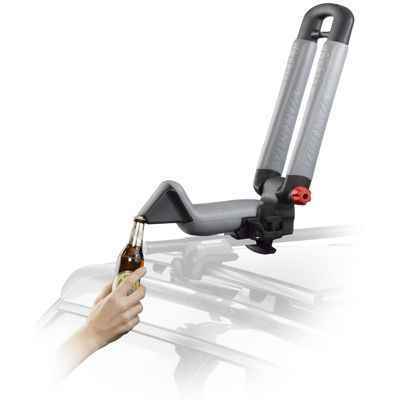 Head on over to their site and get entered for this neat item that I'm sure can be very useful in the backcountry. As always, be on the lookout on the Outdoor Blogger Network (OBN) Rebecca and Joe always have some great gear to give to us outdoor bloggers to have and review and this week is no different. This time up they have some hats from Tilley, and we all know if you are going to be outdoors in the sun, there's nothing better than a hat to keep your head and face shaded. 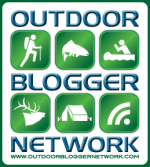 Of course remember for this one you have to be an outdoor blogger and your blog has to be in the OBN directory. That's all we've got this week. Stayed tuned next week for another round up, a giveaway of our own (you won't want to miss out on this one), and a trail report. Yep we are finally hitting the backcountry this weekend for an overnighter in the woods. Woot!